Walermis is a unique name for an average adware-type program. This application has been developed to display third-party advertisements that you probably do not want to see, and, if that is the case, you should remove it at your earliest convenience. Apart from displaying advertisements, Walermis does nothing. It is not useful in any way and will only cause you a lot of inconvenience. But before we get into that let us discuss where this application comes from. 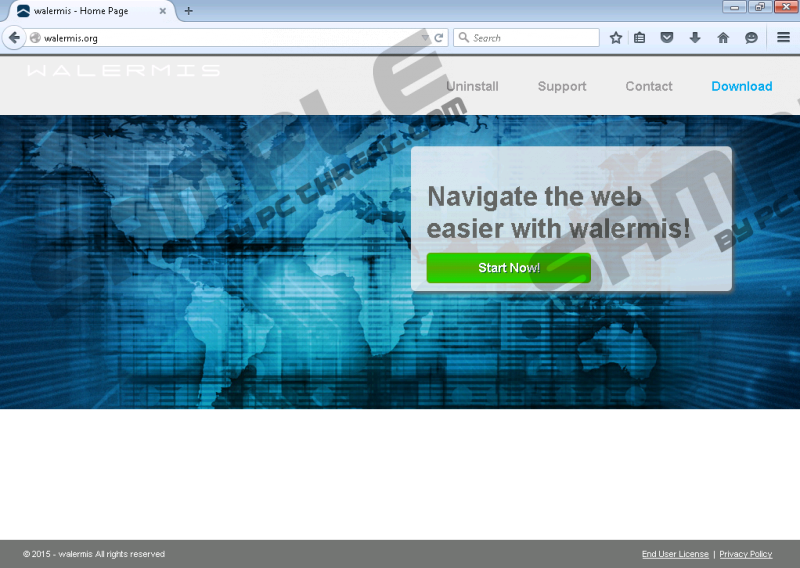 Walermis belongs to the SuperWeb adware family. SuperWeb is a limited liability company that is owned by the Sambreel/Yontoo group, a web advertising company based in Carlsbad, California. This company is widely known for distributing browser extensions that promote commercial content. Walermis is neither the first nor the last application this company has rolled out. We can also mention a couple of older SuperWeb programs that you can still accidentally download. This list includes, but is not limited to, Computer Chair, Dig Deep, Thirteen Degrees, and Web Layers. These applications are almost identical; only the names differ. The license agreement says that Walermis can render “search-related ads, banner and video ads, in-text ads and links, transitional, interstitial, and full page ads.” Obviously, this wide array of advertising options is not beneficial to you, because the ads are annoying. Furthermore, the license agreement states that the developers are not affiliated with or responsible for any third-party advertisements. This means that, if your computer is harmed or if you experience a financial loss, the company that advertised the products and services cannot be held accountable. Shedding responsibility only makes this application even more unreliable, as it only increases the suspicions that some of the promoted content is unreliable. In conclusion, Walermis is definitely not a useful application that you would willingly install. Its only purpose is to display unreliable advertisements that can cause you all kinds of trouble. Furthermore, the program is set to collect information about you that is used for “improving your browsing experience” and might even be shared with third parties, so, if you do not want this application compromising your computer’s security, you should remove it ASAP. Find Walermis, right-click on it, and click Uninstall. Find Walermis and right-click on it. Open the browser and press Alt+F. Find the extension and click the Remove button. Open the browser and press Ctrl+Shift+A. Find the plug-in and click the Remove button. Open the browser and press Alt+T. Quick & tested solution for Walermis removal.